Hi there Shabby Creek friends! It’s Laura from Inspiration for Moms back with a very festive treat. 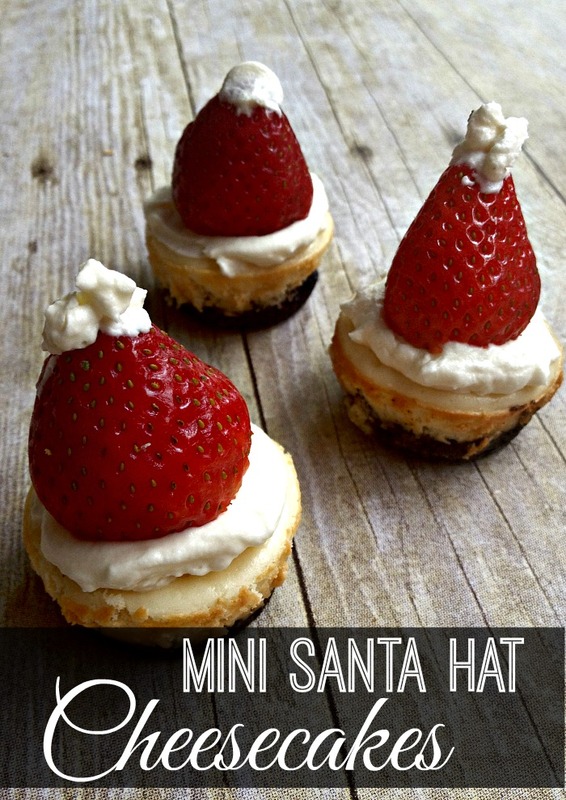 Christmas is only a few weeks away and if you’re looking for a cute holiday dessert to impress your family and friends, look no further! 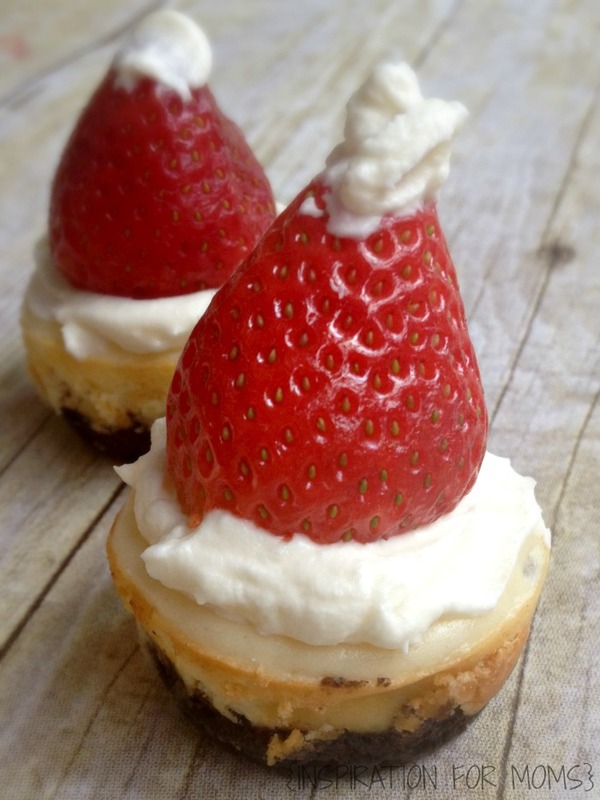 My Gluten-Free Mini Santa Hat Cheesecakes not only look cute, they taste divine! I have always been a lover of cheesecake. But because of it’s rich flavor, I can take days to finish just one slice. 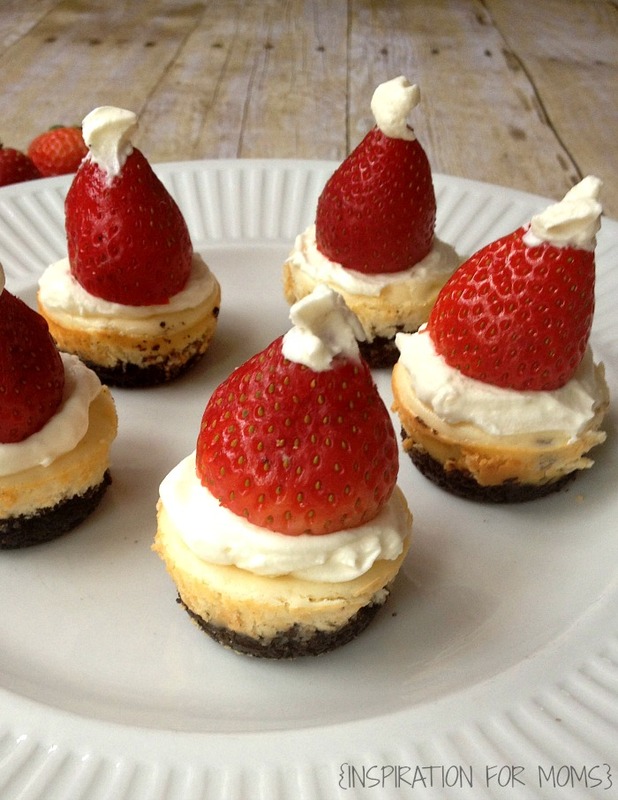 That’s way these mini cheesecakes are the perfect size. I used Glutino gluten free chocolate vanilla cream cookies for the crust (removed the creme) and then topped that with a creamy eggnog cheesecake filling. Eggnog? Oh yes! This is the holidays! 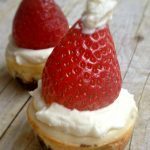 😉 To create the Santa hat look, I layered some homemade whip cream and a some organic strawberries. What do you think? Adorable! I wish you all a very Merry Christmas and can’t wait to see you again in the New Year. Feel free to hop by Inspiration for Moms anytime and say “Hello!”. Preheat oven to 350 degrees. Lightly spray a mini cupcake pan with cooking spray. In a food processor, blend cookies until only crumbs remain. Combine crumbs with butter and sugar. Divide between the 12 cavities of the mini cupcake pan. Press down firmly to create an even layer. Bake for 5 minutes. In a stand mixer beat together cream cheese and sugar until fluffy and smooth. With mixer running on low, slowly add eggnog, flour, vanilla and salt. Gradually increase speed mixing until no lumps remain. Finally mix in egg and combine until no streaks remain. Divide the batter between the mini cupcake pan cavities. Bake for 15-18 minutes or until cheesecakes are set. Allow cheesecake to cool on a wire rack until they are room temperature. Transfer cheesecakes to refrigerator to chill overnight. Carefully remove the cheesecakes from the pan. Top off with the whipped cream and strawberries. 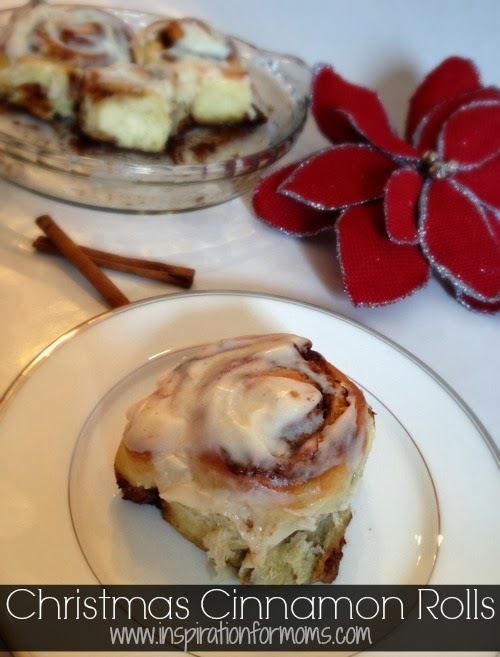 Optional: Sprinkle with powdered sugar for a snow dusted look.